These homemade breakfast biscuits are bigger, better, prettier and tastier than anything you’ll find at a fast food place or diner, and probably have a lot less fat. How can you resist these? Don’t be scared. They go together pretty quickly, and the payoff is enormous. Make customized versions, and you’ll fast become a legend in your own kitchen! This recipe makes 6 breakfast biscuits, and they are big. If you have a chance to get medium eggs, do so, I found the large eggs were just a tad too large, some of the whites spilled out of the biscuits, but no biggie. In a bowl whisk together the flour, the baking powder, and the salt, add the butter, and blend the mixture until it resembles coarse meal. Add the milk and stir the mixture until it just forms a dough. Gather the dough into a ball, on a lightly floured surface knead it gently 6 times, and cut it into 6 equal pieces. Roll each piece of dough into an approx. 7-inch round, form a 1/2-inch-high rim on each round by turning in the edge of the dough and pinching it until the shell measures approx. 5 inches. This does not have to be perfect, but a high outer crust will help contain the egg. The rustic look is great! Transfer the rimmed rounds to 2 buttered large baking sheets. Divide the cheese among the shells. Top with veggie/ham mixture. Now, make a well in the center by pushing the filling to the rim (this step is important!). Original directions: Crack and drop an egg carefully into the well of each shell. Bake the bicuits in the middle of a preheated 425°F. oven for 12 to 15 minutes, or until the egg yolks are just set. My directions: Following the original directions produced hard-boiled eggs, which made the biscuits easy to eat (and pleasing to the kids because they were, most definitely, finger food–they turn out like small pizzas!) BUT, I like soft eggs, so I cook the biscuits without the eggs for ten minutes. Then I carefully crack an egg into the center of the biscuit and continue cooking until the egg yolk is set, but still soft (usually 3-4 minutes more), and the white is completely cooked. Thanks for stopping by my kitchen this morning. I’d love to hear what you have to say! 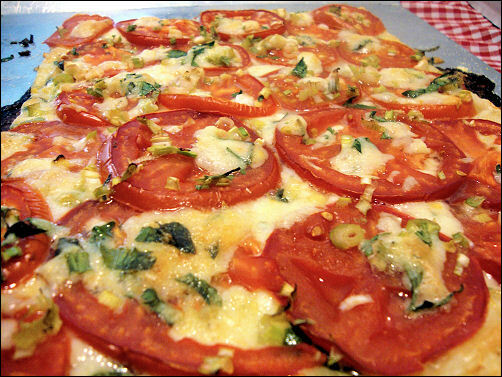 1 sheet puff pastry, thawed 2 cups thinly sliced tomatoes (five or six medium tomatoes, discard the top and bottom slices) 1/3 cup thinly sliced green onions 1/2 cup thinly sliced basil leaves 1 Tablespoon thinly sliced fresh oregano (or pinch of dried) salt, pepper 1/2 cup shredded mozzarella 1/2 cup crumbled feta 1/4 cup grated Parmesan AND 1/4 cup grated Parmegiano-Reggiano (OR, 1/2 cup of just one cheese) Preheat oven to 375 degrees. Lightly coat an unrimmed cookie sheet with cornmeal, oil or spray (I prefer to use the cornmeal). Unroll puff pastry, thin out a bit by rolling, then prick all over with a fork. Place in hot oven for 10 minutes. Meanwhile, slice tomatoes and place on 2 layers of paper towel. Roll towels with tomatoes, and set aside for tomatoes to drain while you mix the cheeses, basil and oregano together in a bowl. Remove puffed pastry from oven. Sprinkle 2/3 of cheese/herb mixture over hot pastry. Place drained tomato slices on top of cheese. Sprinkle with salt, pepper, sliced green onion, and remaining cheese/herb mixture. Return to oven and cook for an additional 15-20 minutes, or until golden. Thanks for stopping by both my kitchen, and my garden, today. It’s been a fun summer, but I am ready for fall. If you make this, let me know how you like it! Every morning, every good, calm morning, I browse the food blogs. Most mornings I print off a few recipes. The recipes then sit around for awhile and I revisit them from time to time. Eventually, I do try some of the recipes. Very few of the recipes I repost “as is”. Some recipes show promise and I work with them for a bit (I have been working on a recipe for Orange Creamsicle Cookies for a few months now). I probably post (or plan to post) about 50% of the recipes I test. This morning I found this recipe. This afternoon I printed it off, picked two pounds of tomatoes from my garden, and went to the store for some fresh mozzarella. This evening I made the recipe (since our temperatures have finally dropped about 25 degrees in the last two days, I was OK with turning on the oven for 45 minutes). This lasagna was creamy, cheesy and fresh tasting, lighter than regular lasagna, but still rich. 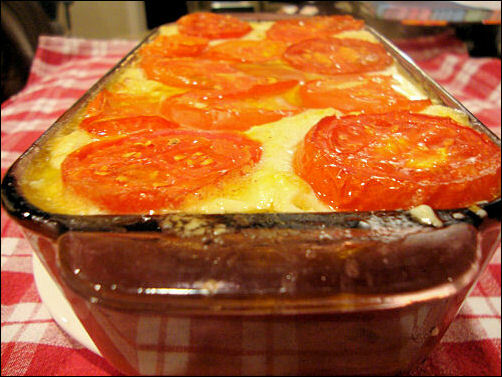 Since there are so few ingredients in this lasagna that, if you decide to make it, be sure your tomatoes are the BEST and your olive oil is the best you can get. Although this pan of lasagna looks very small, it would certainly serve four people. The original recipe can be found at SortaChef, One Hot Cat in a Woodfired Kitchen. I changed the Bechamel Sauce to more closely resemble one I have made many times before and really like the flavor of (adding nutmeg, allspice and Parmesan cheese). I also added some chopped fresh basil (thanks to a suggestion from my friend, Jeanne) and oregano, and changed the method a bit. Pour 3-5 cups very hot water (about 150 degrees) into a loaf pan or casserole dish and slip the no-boil noodles in one at a time. Let noodles soak for 15 minutes. Make the Béchamel sauce. Heat milk in microwave for one minute. Melt butter in a quart-sized saucepan over medium heat. Once the butter is barely melted whisk in the flour and cook for 2 minutes. Turn off heat. Whisk in one third of milk and incorporate thoroughly before adding the next third. Be sure the sauce is smooth before you add more milk. Once you have successfully added all the milk and the sauce is hot and smooth, add in the salt, pepper, nutmeg and allspice. Whisk in the egg. Turn heat back onto medium and cook sauce for 2 minutes. Remove from heat, cover tightly with a lid and set aside until ready to use. 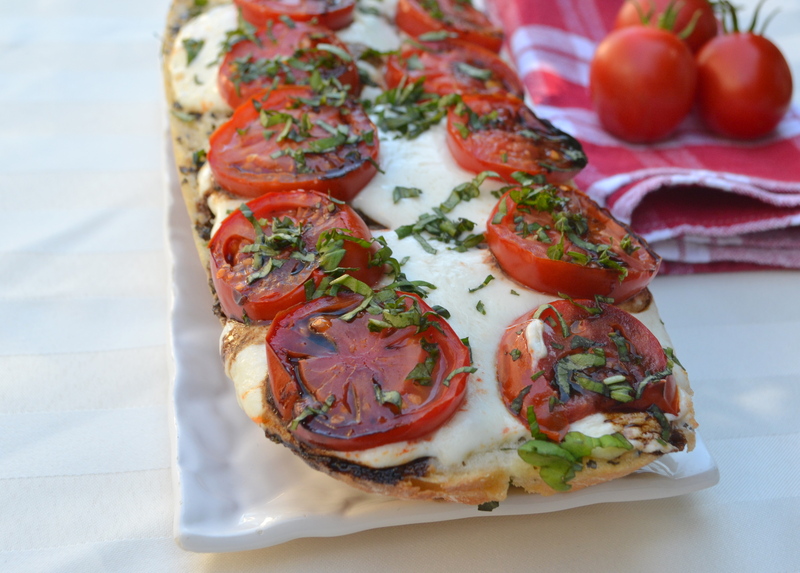 Slice 8 ounces of Buffalo mozzarella (or other fresh mozzarella) into ¼ inch pieces. Slice the tops and bottoms off of the tomatoes and discard or reserve for another use. Cut the rest of each tomato into ¼ inch rounds. Coarsely chop the basil and oregano. A layer of uncooked tomato slices, pack as many in there as you can. Drizzle with your finest olive oil and sprinkle with 1/4 t. salt, 1 t. basil and 1/2 t. oregano. Continue the sequence with remaining noodles and filling, finishing with a layer of tomato slices drizzled with olive oil and sprinkled with salt, basil and oregano. Bake at 375º for 40-45 minutes, until béchamel has puffed up and the edges are bubbling. Thanks for stopping by my kitchen, and my garden, today!